TrueNicks Enhanced hypothetical mating reports are made available by subscribing stallion farms as a service to breeders, allowing you to run unlimited free reports with subscribed stallions whose names are preceded by the enhanced logo. 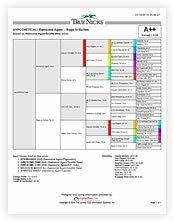 Reports for all other stallions can be ordered through TrueNicks.com for $25 each. TrueNicks reports are generated in real time with up-to-date race results from the vast database of The Jockey Club Information Systems—the world's most complete record of Thoroughbreds and their performance. The rating evaluates sire line crosses based on actual opportunity (stakes winners from starters). All black type races—even restricted and state-bred black type stakes—are considered in the ratings, making TrueNicks an invaluable tool for regional, national, and international markets. The Enhanced Report includes data points for starters, auction results, surface performance, racing statistics, and the top 15 racehorses bred on the cross—making it the ultimate nicking resource. For more information about the TrueNicks rating, please use the following links. What is a "No Rating"? Need help completing the Enhanced Report ordering process? Contact us.